Not even 2 years after we launched our last major site revamp, Crestock 3.0, we're back with some huge changes on the site. Read on to find out what's new in Crestock 4.0! Those of you who remember our previous major revamp know that we basically tore everything apart and put it together again. Crestock Version 2.0 was, let's face it, very pale in comparison with what you'd expect from one of the biggest sites in the micro payment stock photography industry - It was a near disaster usability-wise, inconsistent in navigation and difficult to use. 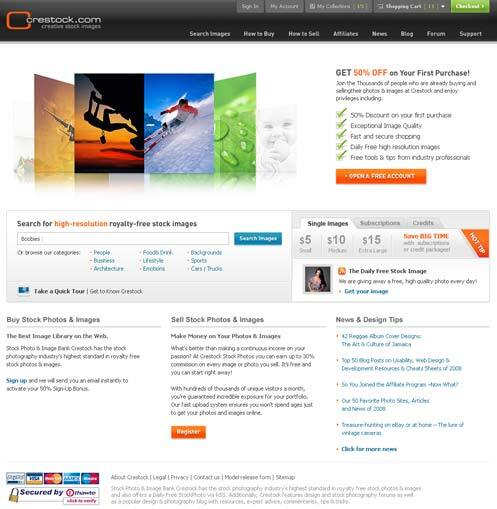 To improve usability both for new and existing customers, we needed define the essence of what Crestock really was; an image search engine and an online store, and we needed to combine the best from these two core concepts. The GUI needed to look and feel like a search engine with the added functionality of an online store - cut through the clutter and get it pure and streamlined in every step of the process of finding and buying images – as well as uploading them to sell. As you can see from the screenshot above from the original 3.0, we've done some changes in between as well, but though Version 3.0 solved many of these problems, both on the GUI and process side of things, there were still things that came up, both through internal discussions as well as from all our members. So we took things to heart and started on top of our complaint list. The first thing you'll notice with the new design is that we've cleaned up the top portion of the site, creating a much clearer menu structure, with the Member and Account navigation at the very top while a main menu is clearly visible beneath, and also introduced explanations on how to use the site and stage indicators to show you where you are in the buying process. You'll also see changes in the Shopping Cart Checkout, the Buy Image Credits & Subscription page as well as Sign-up & login forms et cetera. The focus has been, as usual, to make things as clear and clean as possible, while providing you with the information you need at any time. A lot of the code behind Crestock was from the very beginning of the site, and we discovered that certain parts in particular was never meant for a site with such massive amounts of traffic that we have now. In particular, the search engine has been bogging us down for a long time forcing our poor servers to grinding halt from time to time at peak hours. Our excellent team of programmers have, with the new code as well as extensive use of compression, improved overall performance by about 40% to give you a faster, smoother shopping experience. There are still a few tweaks we'll implement the next following weeks to make the site even faster, but with the incredible growth we've had the past year, yet another server upgrade might happen fairly soon. Though we've spent months working and testing, and hopefully there shouldn't be too many bugs left by now, some things may still cause problems or errors. If you do experience any problems please do not hesitate to post in the comment field below and we'll take immediate action. We'll be releasing changes and updates on an ongoing basis for the next few weeks, so be prepared, and of course, if you like what you see or have suggestions for further improvements, by all means, let us know - constructive criticism is always highly appreciated! Absolutely fabulous! Gorgeous, sleek design and sooo much faster. Great job guys! I have not be able to purchase any photos for the past 2 days! Please resolve and credit my subscription account for the days lost. That's 2 days lost. Someone please help?? When I open the selected file, I get an error message. This has been over the last 2 days. Ever since Friday the 3rd, have not been able to checkout any images and have sent in contacts requesting the problem be resolved. I would appreciate it if 'when' this is resolved the lost days as to where we could not download images are credited back to my account. I have a long-time subscription. Hi everybody, and thanks a lot for your feedback. Our programmers are looking at the different issues raised so far, and those of you who have lost a few days of your subscription will obviously have these days credited. Keep upgrading and updating! We very much appreciate that you increased speed 40%...and respectfully ask that you push the bar even higher. I know it is one step at a time, and you have just taken a great step. Once you get the checkout working, patch other bugs, and credit accounts, take a day off then come back looking to one-up yourselves again! You are building a truly great service, but your website cannot be allowed to drive away customers as it has done in the past. I have been looking forward to subscribing again in the future, but honestly I was dreading the abysmally long search result population and thumbnail loading delays. My spirits have been lifted by this demonstration of commitment. Keep up the good work guys, you have the best business model in the industry, just remove the barriers to greatness. @gthomas: thanks a lot for the props. We've been busting our collective asses on this one (last friday was a 14hour marathon with 2x10min breaks for me) , but I can guarantee you we're not even close to finished quite yet. The search results, as you've pointed out, is our weakest spot right now, and you should expect to see further improvements there by the end of the week, where frequently used search phrases, such as "white" , "art", "background" etc will be down from around 30 seconds to about 3-4 seconds: 10 times faster than what it is right now. In summary files sizes to the browser is down 55-60% and we have been able to cut another 3-4 second off every page load by reordering the sequence that the browser sees the data. We will have caching finished this week, and we should be able to increase server loads by 7-10 times. The cart is back up and running! I appreciate your hard work getting everything back up and running ASAP! I do feel like I need to bring to you attention that I have emailed/form mailed your support team many times without even an acknowledgment of them receiving my messages, much less addressing them. I really like Crestock. And I would LOVE to promote you! But, if you purchased a service for 90 days, and it was nonoperational 10 percent of the time, without being reimbursed for the half dozen times it was down, much less never even being addressed, would you want to promote you? I know it's a tough question. But, I REALLY want you to succeed! @ENDURA: You are absolutely right, and it's very unfortunate that you and others don't get any replies from us when you email our support team. When you email support, it's because you need help, and you usually need help there and then - not a week after you emailed us. We have looked into this in the past (and solved quite a few issues then), butI promise we'll look into these issues again. I did post a congrats on the forum ... should have looked here first !!!!. Once again, the site looks fab. Loads / downloads much faster and is an overall BIG improvement. Some hours at the day it works, some days not. I spent to much time to try the picture download on several computers instead to do my real work. And so I think, that I loose today another day of my subscription. Today I don't get an error - nothing happens. Thank you. I appreciate your acknowledgment that Crestock has not followed up on emailed concerns. And that you are taking this seriously. But no one has address those of us who are subscribers that have missed several days of downloads due to an out-of-commission shopping cart system. Does Crestock intend to credit our accounts for those days lost? I received your email and credit for the lost days! Thanks so much for your vigilance! Yeah guys it looks fine and really mcuh better than the previous version but I think you should admit that the interactive flash element in the top left corner looks(and functions) strange, I don't like tha the images were not loaded all at once. when the visitor sees how the images appear one by one and only after the gallery starts playing.. he gets an impression that something has gone wrong or malfunctioning. It's just my opinion. Please tell me why this keeps happening? We're currently waiting for your payment to finish processing. You will be automatically transferred to the download page in about 30 seconds. If you're not automatically transferred, or simply don't want to wait, please click here to continue. I have seen it sit on this page for well over 8 hours EVERY DAY I order. Some days it doesn't release my images until the follow day. I've tried logging-out and logging back in, clicking the "click here to continue" link a dozen times, walk back though the process again (and again). Nothing works. I've lost numerous days since you've (kindly) credited my account for the previous days lost. I'm not even asking for another reimbursement. I just want my account to work so I don't have to keep coming back, hour after hour to see if my images are released yet.